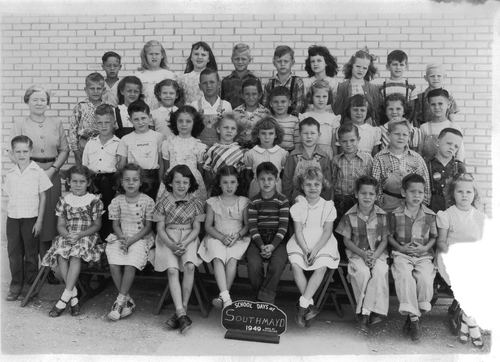 Charles Simmons contributed this photo of his 1st grade class. He submits the following identification information and invites others to fill in the missing names. Mrs. Armstrong was the teacher. Bottom row, left to right: Standing, Mark ? , _ , _ , _ , Kay Russell, Billy Denning, _ , Twins (can’t remember their names), Linda Lane. Second Row: Charles Stephenson, Ronnie Potter, _ , _ , _ , Richard Mann, _ , _ , _ . Third Row: _ , Noreen McGregor, _ , Dale Hornback, _ , _ , Jeanette Turney, Joann Peters, Carol ?, Jimmy West. Fourth Row: _ , Jody Bugg, Glenda ?, _ , Jessie Murphy, Kathryn (Kitty) Hicks, Betty Smith, Charles Simmons, _ .